So he ran ahead and climbed a sycamore-fig tree beside the road, for Jesus was going to pass that way. 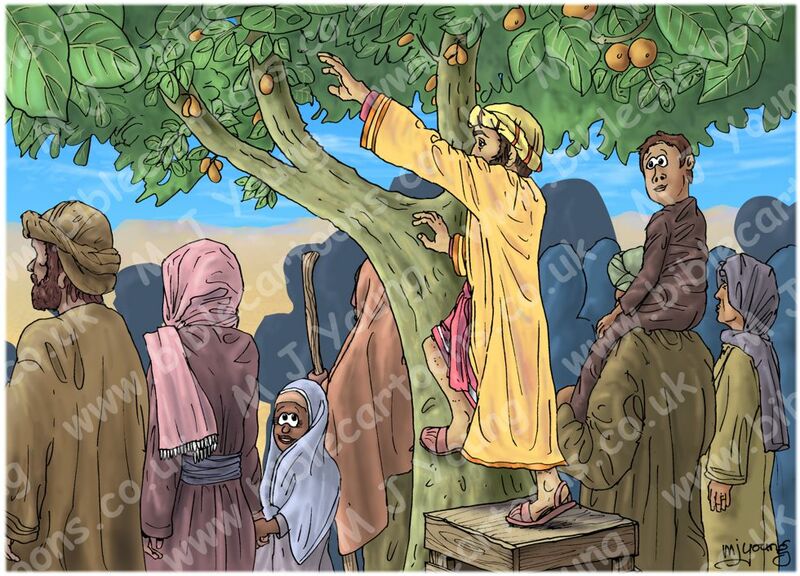 Zacchaeus climbing a tree, crowd of Hebrew people. I had to take a photograph of myself to get the figure right for Zacchaeus climbing the tree in this scene! I also took lots of photo’s of my back for all the figures looking at Jesus! I’ve used the same idea of the crowd (represented by simple dark shapes) in this picture which I have used in the previous scenes. It gives the sense of a multitude of figures without me having to draw each one! I liked including the two children in this scene, who are watching Zacchaeus as he scrambles up the tree. It’s nice to have children in a crowd scene. I usually have them noticing things the adults are missing!